Peter Hain - who resigned from the government in January to "clear his name" over undeclared donations and has now been told he will not face any charges - had been one of the most colourful and outspoken characters to have sat in a Labour cabinet in many years. In an age of on-message "machine" politicians, Mr Hain stood out - not just for his radical past but for his willingness to speak his mind on politically sensitive issues such as Europe or higher taxation. As a leading anti-apartheid campaigner in the 1970s, he had actually achieved something before coming into politics, when many modern ministers can boast nothing more exciting than a career as a researcher or journalist on their CV. He is certainly the only cabinet minister to have been framed for a bank robbery - when he was a thorn in the side of South Africa's political establishment in the 1970s. But Mr Hain was also ambitious. He switched his allegiances from the Liberal Party to Labour at the end of the 1970s and set about a methodical climb to the top, through the trade union movement and then, in 1991, as MP for Neath. He was close to Labour leader Neil Kinnock and gained a reputation as a smooth political operator, perma-tanned and ever ready with a quote for journalists. He liked to portray himself as being slightly to the left of New Labour and seemed to revel in his reputation for plain speaking. Within weeks of taking over from John Reid as Commons leader in 2003, he was slapped down by Tony Blair for remarks that higher earners should contribute more in tax. He was certainly never likely to settle for the "safe pair of hands" route through government, although he also had a reputation for competence. He was one of the first in the cabinet to throw his weight behind Gordon Brown to succeed Tony Blair as prime minister - and quickly announced he wanted to be Mr Brown's deputy, eight months before there was a vacancy. He courted the left wing vote - calling for voluntary curbs on "obscene city bonuses" - hoping his traditional support base in the trade unions would be enough to win the day. But when victory seemed to be slipping from his grasp, he changed tack, drafting in lobbyist Steve Morgan to revamp his campaign. He was relaunched with a glitzy, US-style campaign emphasising his radical past. Full page adverts were taken out in a national newspaper at a reported cost of £25,000 and glossy inserts paid for in left leaning magazine The New Statesman. But the expensive gamble did not pay off and he came fifth out of six. Worse, his campaign - which spent far more than the other contenders - was left with massive debts. It was forced to seek donations from some of Mr Hain's wealthy friends and former associates, with some of the cash channelled through an unknown think tank, the Progressive Policies Forum (PPF), which had been set up by a member of his campaign team. It was the late declaration of these donations totalling £103,000 that led ultimately to Mr Hain's downfall. He blamed the demands of his cabinet jobs for not keeping a closer eye on his deputy leadership bid's administration. But some at Westminster began to question the scale of the donations and the role of the PPF think tank in the affair. Gordon Brown stood by Mr Hain - but also inadvertently handed the opposition ammunition to use against him when he said Mr Hain had been guilty of "an incompetence". When the Electoral Commission, which had been investigating the donations, decided to call in the police Mr Hain resigned within minutes, saying he had "no alternative". He said he "severely" regretted the late donations but insisted it had been an "innocent" mistake. He said it was "absurd" to suggest he had deliberately avoided declaring the donations. As police handed their file to the Crown Prosecution Service, he said a mistake had been made by his team but it had been an "innocent mistake", to which he had alerted the authorities, adding he hoped his name would be cleared "as quickly as possible". 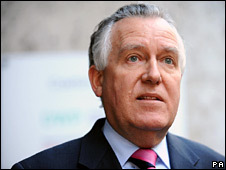 Born in Kenya and brought up in South Africa, Peter Hain was educated at Pretoria Boys High School. After coming to Britain in the mid 1960s, he attended the University of London and Sussex University. By 1969, aged 19, he was himself a leading anti-apartheid campaigner, making the headlines with his disruption of the all-white South African rugby and cricket teams' tours of the UK. 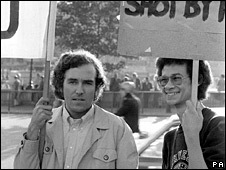 He joined the Young Liberals, becoming chairman in 1971, and remaining a prominent activist throughout the 1970s. Already a household name, his profile rose even higher in 1974 when he was arrested and charged with robbing a branch of Barclays Bank near his home in Putney, south London. He was acquitted at a subsequent Old Bailey trial, and later evidence emerged suggesting that the South African security services had attempted to frame him by employing a "double" to carry out the robbery. In 1975, he married his first wife Patricia, the mother of his two sons. In 1977, he helped found the Anti-Nazi League to campaign against the National Front and other far-right groups. In the same year, he joined the Labour Party and worked as a trade union official until entering the Commons at a 1991 by-election in Neath. Wales became his adopted home and his first job in government, in 1997, as junior Welsh Office minister. The Foreign Office came next, where he became minister for Africa, followed by a short stint at the Department of Trade and Industry as energy minister. He returned to the Foreign Office after the 2001 general election as minister for Europe, which transformed him into an enthusiastic supporter of British entry into the European single currency. He went to the Northern Ireland Secretary, playing a key role in negotiations to bring peace to the province through a power sharing executive - another significant achievement in a long political career. Throughout it all he remained one of the most recognisable and best known figures in the Labour Party, and given his previous record it would appear unwise to rule out a high profile comeback in the future.